Ercuis is a prestigious maker of French silverplate, established in the 1860s. 'Lauriers' is an elegant pattern reminiscent of the French Empire style. A thread outlines the handle, and an oval medallion space is created by acanthus leaves punctuating the top, with delicate branches of laurel/bay leaves and berries closing off that space. The pieces are double-struck, and a beautiful MG monogram is placed in the medallion of the reverse side. 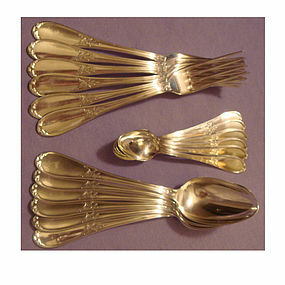 This set was surely made for the European market, as the table spoon (8-1/2 in.) is larger than the US version, and the teaspoon (5-5/8 in.) is smaller. The fork is 8-3/8 in. Condition is very good, with only polishing traces indicating its past use.